Accommodation The resort features 277 contemporary rooms and suites with views of either the tropical gardens, pool or out to the ocean. The rooms and suites have a modern feel with wood look, stone and marble surfaces along with soft turquoise tones creating a space for guests to relax and retreat in. The room types include; Standard Room conveniently located near the restaurants and central building with views out to the resort, Superior Room with a private balcony overlooking the pool or ocean and Deluxe Room offering an outdoor terrace with ocean views across the Whitsunday Islands. The resort’s suites all feature expansive views of the ocean with the Serenity Suite looking out to Daydream’s famed Lover’s Cove. Restaurants and Bars Daydream Island will have three new restaurants and three new bars all defined by their own distinct design and flavour. Executive Chef, Keith Le Fevre and Food and Beverage Manager, Adrian Tyler have created menus that showcase the best seasonal produce of the region at each restaurant. Living Reef The Living Reef is a free form coral lagoon spanning 200 metres throughout the resort and holds over 1.5 million litres of fresh water and is home to hundreds of marine fish, coral, stingrays and sharks. 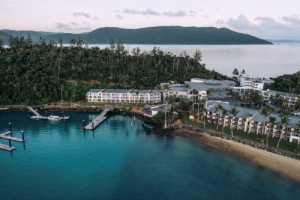 Led by a team of marine biologists and Head Marine Biologist and TEQ Ambassador, Johnny Gaskell, the Living Reef gives Daydream Island an authentic connection to the Great Barrier Reef and its marine life. Activities The resort has a host of activities for guests to experience such as snorkeling adventures, helicopter tours exploring the island & surrounding Great Barrier Reef as well as sailboat and jetski hire. Conferencing and Events Daydream Island has already become a sought after destination for major events and weddings, with capacity for the island to be completely booked for private events. Special events from cocktail parties to gala dinners can be catered for across a large range of indoor and outdoor event locations. Guests visiting the island for conferences have access to the latest technology audio visual equipment across three dedicated conference rooms.